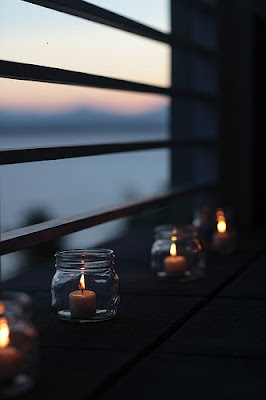 I love the look of these glass Ball jars... Maybe it's because summer is right around the corner? 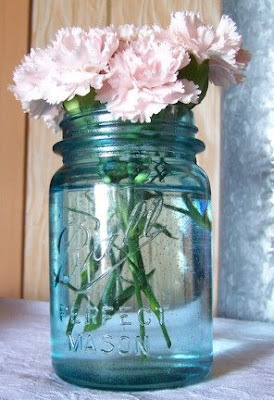 These jars just seem like the perfect thing to hold fresh flowers, or even a candle out on your porch or patio. There is something so comforting about them; maybe it's because they have been around for over 100 years. 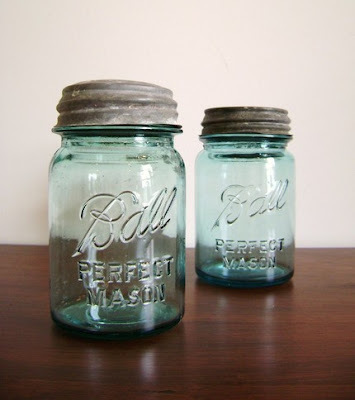 Now, don't pre-judge these jars as "country bumpkin"-- I think that they would look just as cool in a really modern space as they would on the front porch of a farmhouse. Founded in the 1880s, the Ball Brothers Glass Manufactoring Company began in Buffalo, New York and then quickly moved to Muncie, Indiana to take advange of the natural gas resources in the Midwest. 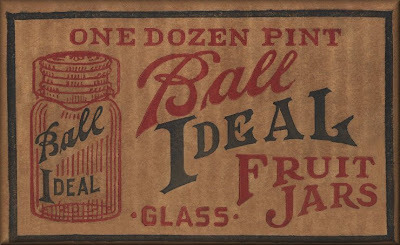 As extremely successful businessmen, the Ball brothers began to purchase and operate smaller glass jar companies to secure their place in the canning jar industry. As a mass produced product, these jars were not initially viewed as a valuable commodity. 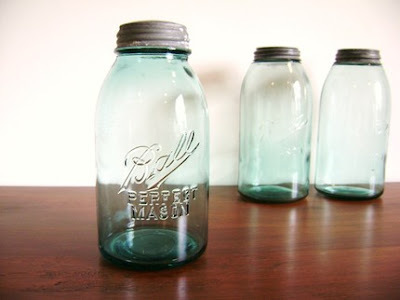 However, as time passed and the technology of glass production progressed, different types of Ball jars became widely sought after and desired by collectors. To increase the brilliance of the glass, different metallic oxides like Manganese and Selenium were added to the glass mixture. When compounded with UV light, the glass would turn brilliant shades of purple (due to the Manganese), or amber (due to the Selenium). 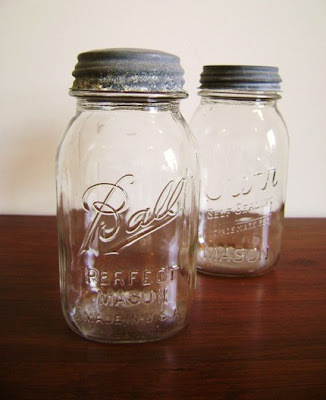 These jars are very rare and sometimes extremely valuable. 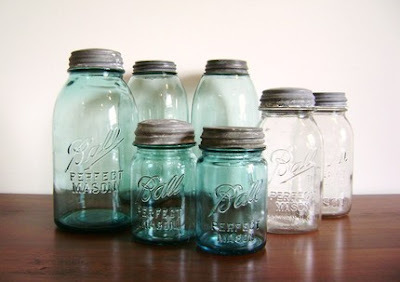 When I shop the flea markets, I sometimes find blue glass Ball jars (my favorite!) 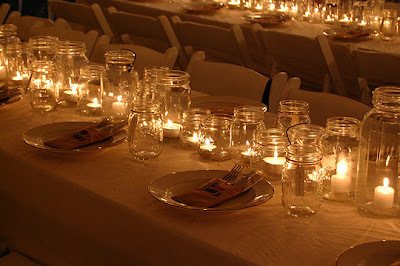 or clear glass jars. I believe the blue jars were produced in the 1930s and 1940s, but I can't be sure. I am by no means a collector, but I do love the way they look and will always be attracted to their familiar "all American" feel. Here are some Ball jars that are NEW in the shop! 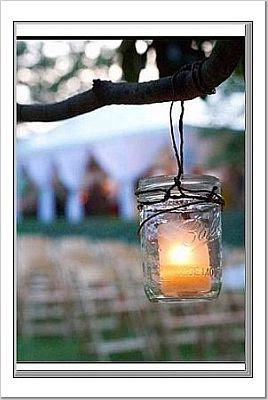 Visit this informative website for information on canning jars. They will also help you "date" your jar! the above image from one of my favorite blogs, "A Day that is Dessert"
lovely collection; thanks for the mention! 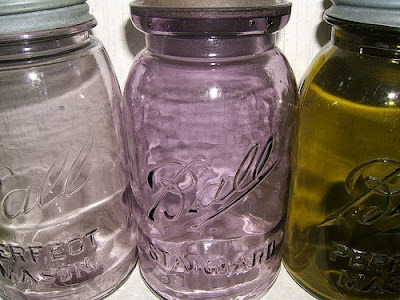 I sooo love me some vintage ball jars. Check out my collection!